Way too often I say to myself, “Just this one more, and I’ll be all done.” In truth there is no, “All done”. It’s hard to stop doing things, though. I’m sure you’ve noticed. For me, even when I feel that I’m getting too tired I still say, “Just this one more…” That’s despite knowing that if I stop and rest, then return to the task, I can accomplish hugely more because my body is rested and fresh to carry on. While I’ve jokingly wondered if Newton’s First Law of Motion, also called the Law of Inertia, accounts for “one more thing” thinking, the law actually seems seriously apropos. It states: Things in motion tend to stay in motion, and things at rest tend to remain at rest. So, there’s more to Newton than apples and gravity. I’m just saying, that seems like inertia at work, to me. As an aside, the King’s College Wrangler I lived with in London told me, while we were visiting Kings, that Newton went to Cambridge. 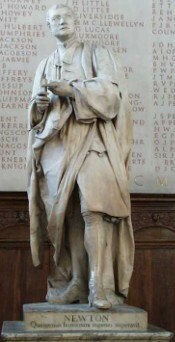 John, the wrangler, meaning he had graduated first in his class, ushered me proudly to the statue of Newton presented to Trinity College in 1755, that is displayed in Trinity’s ante-chapel. At the time, all I remembered about Newton was that he’d “discovered” gravity when he was sitting under an apple tree and an apple fell and hit him on the head. Given how famous Newton is based on putting that apple together with gravity, you’d think that he would have been universally admired. But no, apparently even Isaac Newton was cast for a time, in 1689, as an ugly duckling. He was, you see, nominated by the Crown to be Provost of King’s College, Cambridge. Up until that time the Fellows had always elected as provost the Crown’s nominee. But, in 1689 the Fellows refused to accept and elect William III’s nominee, Isaac Newton of Trinity. Ah, the highs and lows of life. I am reminded that when I was 4 or 5 I invited a little boy I was playing with in to have just one cherry from the pie my mother had made for company. 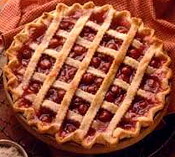 We each had a cherry that we fished out from the lattice work top crust. Then we had just one more. I kept saying, we can have one. In the end there wasn’t one cherry left in the pie — at which point I had an inkling of dismay. 50 years later at my great aunt’s funeral in Oceanside an older couple asked me, “Are you Karen Kline?” I said, “Yes.” They said I’d gotten their son to eat all the cherries in my mother’s pie. They didn’t mention that it was fifty years earlier. They remembered as if it were yesterday.